A Lexus SUV being controlled by Google's autonomous vehicle (AV) technology has crashed into the side of a bus, marking what may be the first accident caused by the self-driving technology while it was in full autonomous mode. The accident, first reported by freelance writer Mark Harris, showed up on an accident report filed with the California DMV on Feb. 23. The collision -- involving an RX450h SUV and a public bus in Mountain View, Calif. -- took place on Feb. 14. The Lexus was in "autonomous mode" while traveling about two miles per hour in the right-hand lane as it approached an intersection and signaled for a right hand turn. Sandbags surrounding a storm drain caused the vehicle to move left, into the center lane. Google's Lexus RX45h self-driving SUV. "A public transit bus was approaching from behind. The Google AV test driver saw the bus approaching in the left side mirror but believed the bus would stop or slow to allow the Google AV to continue," the accident report stated. "Approximately three seconds later, as the Google AV was reentering the center of the lane, it made contact with the side of the bus." 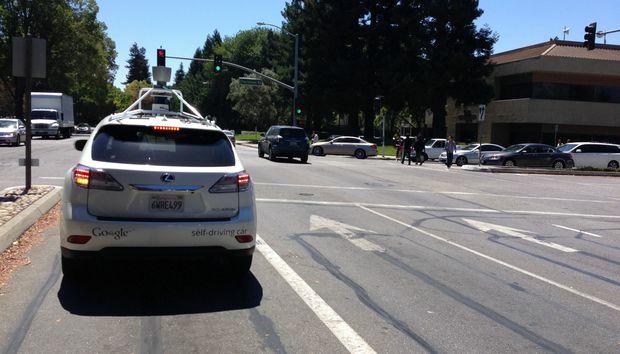 The report indicated that Google car's safety driver believed the bus would yield. The bus was traveling at about 15mph, according to the report filed by Chris Urmson, Google's director of self-driving cars. While no injuries were reported, the Google AV sustained body damage to the left front fender, the left front wheel and one of its driver's-side doors, the report stated. In a reply to Computerworld, Google said its AVs spend a lot of time on El Camino Real, a wide boulevard of three lanes in each direction that runs through Google’s hometown of Mountain View. The boulevard has hundreds of sets of traffic lights and hundreds more intersections, it has helped Google AVs to navigate "a busy and historic artery. And on Valentine’s Day we ran into a tricky set of circumstances on El Camino..."
"Most of the time it makes sense to drive in the middle of a lane. But when you’re teeing up a right-hand turn in a lane wide enough to handle two streams of traffic, annoyed traffic stacks up behind you," Google stated. "So several weeks ago we began giving the self-driving car the capabilities it needs to do what human drivers do: hug the rightmost side of the lane. This is the social norm because a turning vehicle often has to pause and wait for pedestrians; hugging the curb allows other drivers to continue on their way by passing on the left. It’s vital for us to develop advanced skills that respect not just the letter of the traffic code but the spirit of the road." The accident involving a Google AV is not the first. In June of last year, Google began actively reporting accidents involving vehicles using its self-driving technology. Google AVs have been in more than a dozen accidents to date, but all previous ones were blamed on human error, making the latest the first while a vehicle was in fully autonomous mode. Google has 23 Lexus RX450h SUVs performing test drives on California public roads. To date, the vehicles have logged more than 1 million miles, according to Google.